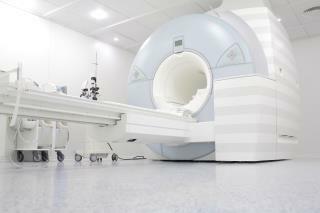 (Newser) – A freak accident involving an MRI machine killed a man in a hospital in Mumbai, India. The details are harrowing: Rajesh Maru, 32, had been in the MRI room with a female relative who was preparing to undergo a scan, reports News18. The fatal mistake: He was holding the woman's metal oxygen canister. Because MRI machines use extremely powerful magnets, no such metal objects can be in the room when one is powered up, explains the Hindustan Times. Police say that Maru was sucked toward the cylinder, and the arm holding the oxygen canister became trapped and, by some accounts, mangled. As attendants tried furiously to free him, Maru inhaled lethal amounts of liquid oxygen that had begun leaking from the canister he'd been holding, according to an autopsy. It's like cavepeople with a Bic lighter. Technology is magic. What's all the fuss about magnets? I don't get the attraction.